Back of the Cereal Box: Where Do the Blue Raspberries Grow, Anyway? Post-Coachella, Sarah put up an article up at Independent.com telling about her experiences as a first-timer. In it, she recalled that I ordered — and consumed — two snowcones, back-to-back. It's true. I did. And I did it with a big, stained grin on my face. (What the article didn't mention is that I asked for extra syrup on the second one, sugar-addled fifth grader-style.) The second of these two frosty treats — which in 100-degree Indio heat seriously rocked my world — was flavored with the delicious but mysterious flavor of blue raspberry. I've often wondered exactly why this flavor exists, much less in the abundance it does today. Raspberries, after all, aren't blue. Yet virtually any candy offering a rainbow of flavor sensations picks blue to be raspberry. The rest (in order) generally go as follows: cherry or strawberry, orange, lemon (though banana flavor for sadistic candy companies), lime or green apple, and finally grape (blackcurrant in the U.K). On a good day, pink might be watermelon, which makes about as much sense as blue raspberry but that's a different blog post. And then, almost always, blue raspberry is stuck there, between lime and grape. Odd, no? I mean, we have tasty blue berries already. They're called "blueberries." Yet the flavor is generally what I imagine is a flavor that doesn't exist in nature matched with a color that doesn't generally appear on non-poisonous things. Sadly, Google is not particularly helpful in solving this mystery, so I have to take what I can get. And that's Wikipedia. Take it with a grain of salt, but the Wikipedia entry for "blue raspberry" states that the flavor does not come from a real blue fruit, but was derived in the late '50s from the juice of whitebark raspberry fruit juice. Its pairing with electric blue food dye, Wikipedia explains, helps differentiate the flavor from strawberry. (And here I thought the color was just for the added benefit of turning one's mouth all Smurfy.) The entry concludes with a short list of various brands that have incorporated the flavor, including (in order) Go-Gurt, ICEE, Dum Dum Pops, Jolly Ranchers, Skittlers, and Hubba Bubba. (Read that list out loud as see if in doesn't put a smile on your face. Works best if screamed. At work.) In short, the concept of blue raspberry is a total fabrication that now sours in my stomach. A small debate on the entry's talk page questions, however, if the flavor might have a real-life basis after all. Some allege that the fruit species Rubus leucodermis — which literally translates to "white-skinned bramble berry" but is more popularly called as the "whitebark raspberry" or, oddly, the "black raspberry" — is known to some Native Americans as the "blue raspberry," though often as the frambuesa azul. Could be, but one should note that a Google search for that turns up mostly Spanish-language sites hawking the same list of candy brands to Spanish-speakers. And if we trust what Google tells us — and who doesn't? — then I think we have our answer. Just wanted to say hi. I was just "researching" Blue Raspberry for my own blog and came across this, glad to see I'm not the only one who wonders! Nice work on all your postings! Well thanks for the compliment. I liked this post a lot and I was wondering if anybody else would notice. Hi. My room mate and I were getting stoned together and started wondering about blue raspberry. We Googled the term and your blog was one of the first sites to come up. I am a library science student, so I really appreciate the research you put into this. Very cool! the exact same thing happened to me haha. the exact same thing happened to me too hehe. While this is an old post, I did want to mention the bit about the whitebark raspberry (aka western black raspberry, aka blue raspberry) is true. 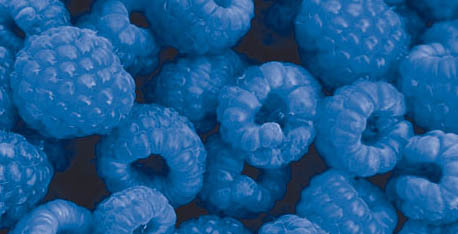 They're called "blue raspberry" because sometimes the berries are a lighter bluish color (though nothing like the day glow food coloring used with the artificial flavor). At one point they were apparently the most common raspberry in the western US, but the eastern black raspberry (Rubus occidentalis) and the "original" red raspberry have suplanted it in cultivation, as they are more consistent in agricultural settings. Doesn't help that all members of genus Rubus, also including blackberries (which are not the same as black raspberries) cross pollinate easily, meaning the wild berries are increasingly hybrids.